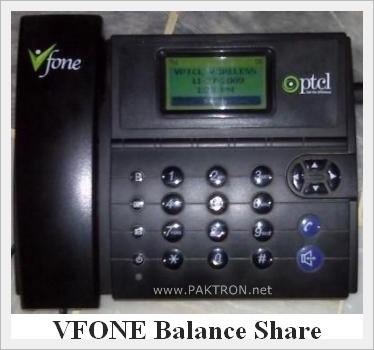 PTCL brings convenience for its Vfone customers by offering balance share service. The service allows PTCL Vfone customers to share balance through a simple code. Customers can now share any amount between Rs. 20 to Rs 2000 on nationwide basis. Enjoying the facility of instant sharing, both the sender and receiver will get an SMS alert in case of successful transfer, in case of failed transfer a failure message will be received at the sender’s end. How to Share VFONE Balance ? The short code for sharing the balance is 828*Amount to Transfer in Rs.*MDN#. For example if you want you send balance of Rs. 50 to a Vfone number you have to dial 828*50*7258766# and press call. The validity of balance shared will be seven (07) days; these days will be added to existing validities of customer’s main account. A small amount of Rs 3.00 + tax will be deducted from sender’s account as balance share charges. “PTCL is striving to provide its customers the convenience of utilizing PTCL services and products without leaving their homes or offices” said PTCL Senior Executive Vice President (SEVP) Commercial, Naveed Saeed. He further added, “This service brings value and additional convenience for Vfone customers”.